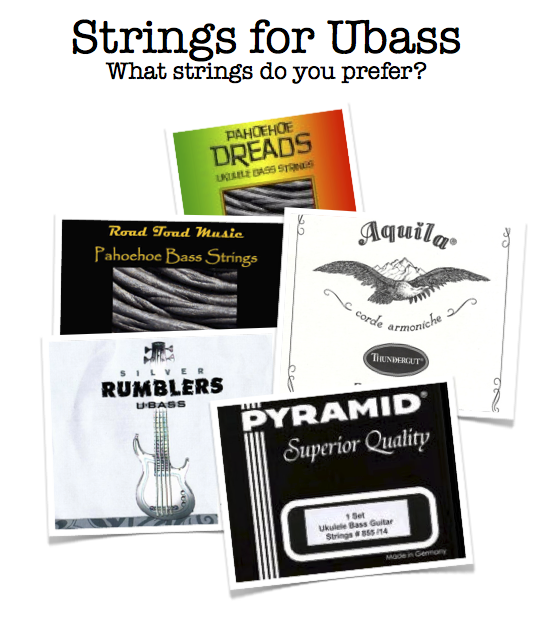 A quick Q for U: What strings do you use on your Ubass? – Play UBass! I like the Aquila Thundergut strings on my fretless Kala solid mahogany U-Bass. I had to cut and re-string my Black Pahoehoe 3 times since May when I bought my U-Bass and they can’t stay in tune yet. They seem to be stretching forever. I’m going to change for the Silver Rumblers. Do you feel the same about all strings or just some of them? For me the G and D strings are the hardest to get in tune. Have you tried the ‘knot’ fix on the D string? G & D strings are harder to tune, right. I don’t use the same ‘knot’ fix as shown on the Kala web site but it’s still some kind of knot (first turn over the string end in the tuner, then other turns under it as usual). When the strings overlap on the tuner I unstring and cut a couple of centimeters then re-string. Did this 3 times since May. I play my U-Bass a couple of times per week. Ok. I guess the thunderguts are easier to get up and running. Have had a set of those on since I guess October last year…I like them a lot…I have the pahoehoe ones on my 5-string California though and they haven’t really settled yet. But I haven’t been playing the Califonia as much as my Acoustic Spruce. So I guess I should restring it again. Happy Ubass playing to you! I treid the thunderguts this week and absolutely LOVED them, I found them much nicer to play and unlike some I actually liked thier tone too. But within a day they were unplayably sticky. I was getting lots of finger noise through the amp and slides weren’t an option anymore which sucked on the fretless. I’m back to the originals now but miss the thunderguts (before they got sticky) already. I have used the same Thundergut set almost a year now. I really love them despite their ‘stickiness’. As you said sliding the (in my case) A and E sting is not really doable. For me it works fine on the D and G string. I have however noticed that the G string seems to have stretched out and there are small ‘dents’ in that string that makes it a bit uncomfortable to play. Still they will stay on a while longer for me! Maybe you could try the Silver Rumblers instead? Haven’t tried them yet but will try to do some sting testing soon! Stay tuned on playubass.com for more. I also have a Facebook page if you’re interested! Simply search for playubass! Have fun with your Ubass! I’m using the original strings, but I would certainly like to find something better at staying in tune, and with better intonation. I have been using my Aquila Thundergut set for about a year now and I really like those strings. I will try the Silver rumblers soon and compare those with the thunderguts. Morten had something interesting to say. Please read his comment! Do you play a fretted of fretless (or both) Jim? Thanks for letting us in on your experience Morten! I really enjoy the blog. Thanks for sharing. I’m planning to build my own U-Bass version with a scale of 23,5″. I have bought latest version of Thundergut but in Aquila website, they say that those strings are not compatible with a scale that longer than 21″. Would the strings be fine if i use them on 23,5″ bass? I read your post about comparison between California and SUB but you were using pahoehoe. By the way the reason i’m using 23,5″ is because i regularly play bass with hard tension strings. When i picked up my friend’s 21″ UBass, I feel the strings needed to be tighter, specially the 4th string. I hope you can give me more information about this. Cheers! use the Aquila strings made for their Short Bass One short scale bass. The model name is 92U. Will you make your own Ubass from ”scratch”? Kala sells solid body Ubass kits! I will soon blog about that here on playubass! I think using the slightly higher tension thunderous or thunder red will improve the more tight feel you’re after. Did your friends 21 inch Ubass have the pahoehoe strings? Good luck with your Ubass endeavors! I know that Kala sells U-Bass kit but i want to make it from scratch since i have my own design. Beside i want to make this journey more adventurous. As an alternative, I might try to build 2 types of neck (21″ and 23,5″) so i can do experiment with both scales. Yes my friend use Pahoehoe but i’m not sure about the tension of the string type. Does pahoehoe have less tension than thunderguts? I believe that the pahoehoe has slightly less tension compared to the Aquila made strings. On my 21,5 inch California solid body Ubass the original strings feels super great! Will try to put some sound samples on my blog from a recent CD I played that bass on! I have the rumbler model and I’m still using the strings it came with (grey, I think they are the Silver rumblers), so those are the only ones I know. They sound great but, apart from the E & A strings get sticky and only talc powder fixes the problem and the intonation on the G string is awful. Which strings would you guys suggest I try instead? The original black pahoehoe strings are nice! At the moment I have the Thinder Reds on my acoustic/electric and Pahoehoe on the solid body ubasses…Will however try something ”new” on a solid body (will work on a acoustic/electric too) soon! Will post a test on the blog once I have tried them for a while! Interesting thread. I have the white thunderguts and am now having some stickiness. Intonation is good on my acoustic mahogany Kala Ubass, but I notice the string noise on larger amps. A treble adjustment helps to filter this out. But looking at a pre-amp to improve it as well.